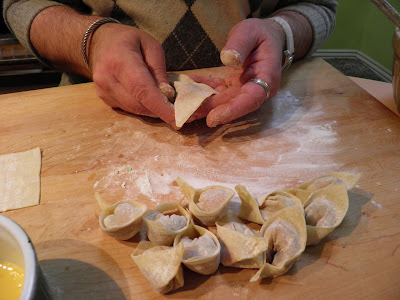 A finished, folded wonton. Not as difficult as you may think! Photos below outline how to do it step by step. 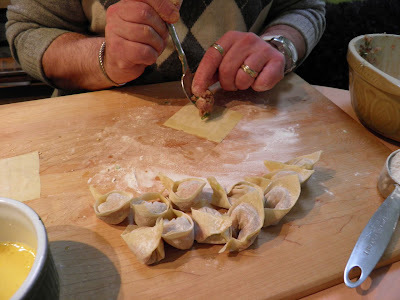 Wontons are one of those things we usually grab from the freezer in the local Asian grocery. Why not try to make them at home? They're not difficult. Only slightly time consuming. It's a shame that more people don't try their hand at making them fresh. Before you stop reading consider this — when you buy a package of wontons you get about 12-16 in a package. This recipe makes at least 50. So you're making more than enough for 3 meals. So in your mind divide the time these take by 3. These wontons are head and shoulders above any frozen packaged ones I have purchased. And the difficulty isn't in complexity, just in time. It took me 1 hour to fill 52, but I was a little slow. They did start to go along faster once I hit my stride. I really suggest you try these. You will be more than pleased with the result. 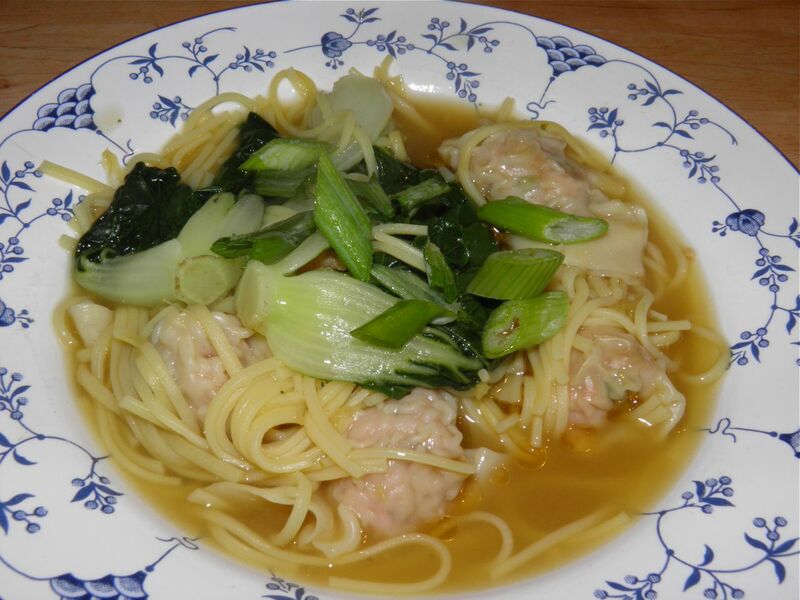 The recipe is for shrimp and pork, but you can make all pork, all shrimp, crab and pork, just crab or even vegetarian. Many other variations exist as well. Next lobster season I may just try my hand at that for a filling. They would probably be fantastic steamed or fried! Excess wontons can be frozen in an airtight container. 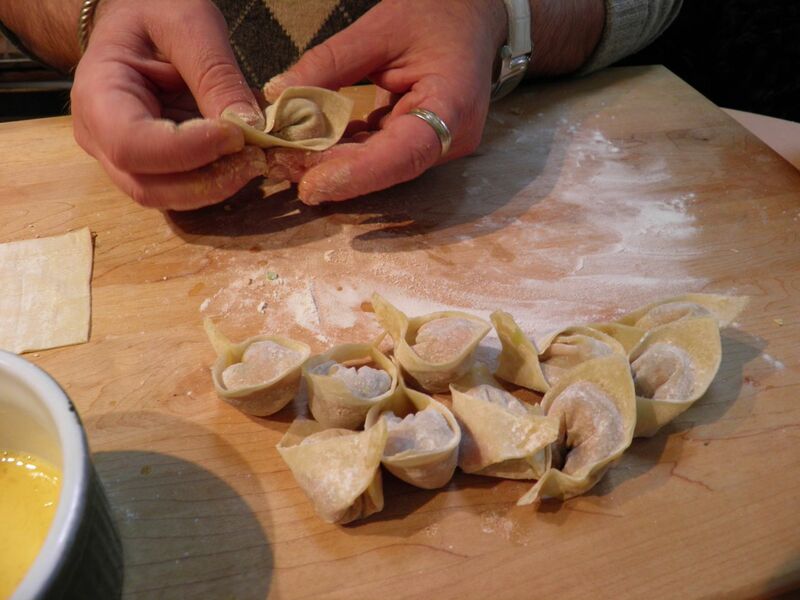 You can steam the wontons from frozen with great results (5 minutes in a steamer). If you want to fry them, boil first until they float and then pan fry in a little oil until crisp. Place the pork in a food processor and pulse until ground. Remove to a bowl. Add the ginger and mushrooms to the food processor. Pulse until well chopped. Add the shrimp and pulse until ground. Add the pork back into the food processor and pulse to combine. Add the salt, pepper, oil, sherry and soy to the mixture. Remove to a bowl and stir in the green onions. That's as easy as it is to make the filling. If making variations in the future, just be aware of the volume of filling this makes. You will need the same amount to fill 50. Your hands will get a little messy so have everything at hand. The directions may sound complicated, but once you make the first one you will understand clearly. Then filling the remainder will go more quickly. Beat the egg in a small bowl and set aside. This is your "glue" to seal the wontons so the filling doesn't escape in cooking. Take one wrapper and place it on the board. 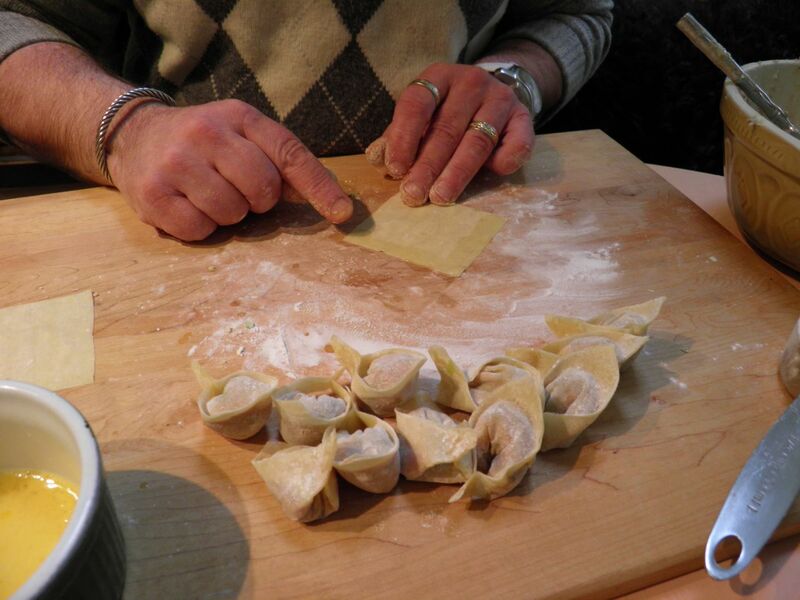 Using your finger, moisten two adjacent edges of the wrapper with the beaten egg. Place a rounded teaspoon of filling in the centre. Fold the wrapper over itself to make a triangle. Pinch the edges closed to seal the filling in the centre. Lay the triangle down with the centre point facing away from you. Moisten one of the bottom (long) points with a little egg. Bring the two points together and pinch to close. You will end up with what looks kind of like a little hat. Repeat with more wrappers until all the filling is used. The filling will make approximately 50 wontons. 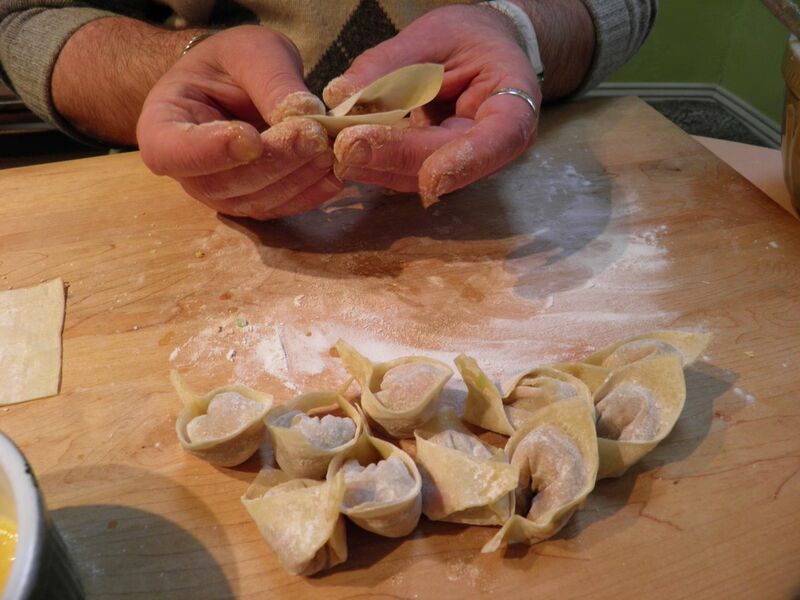 Remaining wontons can be frozen for later use, as the soup requires only 12-16. Combine the stock, ginger, dried shrimp, oyster sauce, sesame oil and salt in a stock pot. Bring to a boil and simmer for 10 minutes. 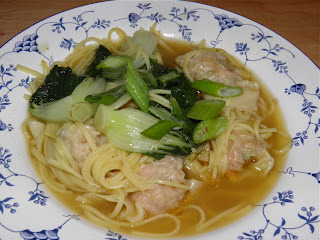 Add 16 wontons and the noodles to the broth. Bring back to a boil, reduce heat to medium and let simmer for 5 minutes. Add the pak choi and simmer for 2 minutes more. The pak choi will still be slightly crisp. Taste for salt. The oyster sauce is very salty so don't just add salt because you think you should. Serve with the green onions and a drizzle of sesame oil atop each bowl. 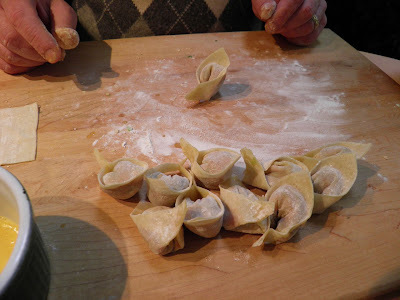 I would try my hand at making my own Chinese noodles, but seeing them being made it looks like quite a process. Maybe... you never know. If you're interested, here's a link to a video. Amazing.